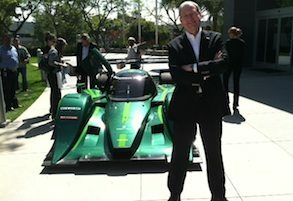 The Drayson racecar traveled thousands of miles to get to San Diego, but Drayson has not conducted any road tests with the vehicle yet. Gilbert said Drayson plans to begin testing its EV racer in coming months as part of a broader campaign to get the International Automobile Federation to sanction an EV competition—perhaps as soon as the souped-up EVs can race for more than 15 minutes before recharging. During his San Diego pit stop, Gilbert also noted that Qualcomm and Samsung announced the formation of the Alliance for Wireless Power (A4WP) last week during the CTIA conference in New Orleans. As Gilbert noted, wireless electricity transmission has been around since the days of Nikola Tesla (1856-1943) and there may be as many as 20 other companies developing wireless charging technologies. The alliance plans to focus initially on wireless charging technology for devices, but the group expects to gradually draw in members from the automotive sector as well.